You are currently browsing the tag archive for the ‘Rosemary’s Baby’ tag. Happy November! Halloween fell on a Saturday night this year and I felt like getting a thrill by re-watching the 1968 psychological thriller, Rosemary’s Baby. I was watching the movie as the clocks fell back an hour at 2:00 AM. A few moments later was a POV shot of a 1965 November calendar–half a century ago. 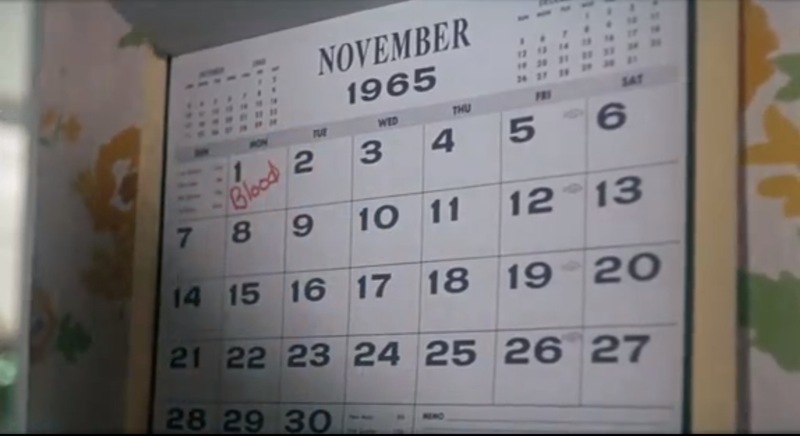 The first Monday of November ’65 is ominously labelled “Blood”.